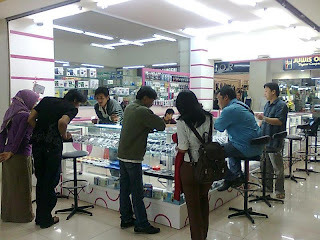 batam activity: Grand Opening Interphone, Originality Prioritize product ..! Grand Opening Interphone, Originality Prioritize product ..! You want to buy a new Mobile or Mobile marks? Research Mobile which will you buy. If you are going to buy a new Mobile, Mobile to ask for a sealed box which is still intact. Because if not sealed let alone without the box, this could be a trick from a seller who said that Mobile second hand is HANDPHONE NEW ...!! But not so with Interphone, outlets that provide multi-brand mobile phone, which is located in Nagoya Hill Super Mall. Inetrphone Positioning by Hery as managers, implementing the concept of product originality. "At Interphone we want to give image to the public, that the various types of mobile phones offered are genuine and quality" Hery said. Batam fame as a paradise it has become electronic talked to the newcomers. That's why mobile phone business in Batam, has a very good development. With the same ground trying to offer Global diversity in the provision of this communication gadget. Brands of well-known vendors such as Nokia, Soni Ericsson, Motorola, Samsung, Ht and Lexus provided in Global Nagoya Hill. In the context of Grand Opening .. Friday (01/01/ 10) yesterday, Interphone provides special souvenir for the first 30 buyers. "Giving souvenirs as a token of appreciation to the Global mobile community in Batam, we provide a variety of formal and quality products from various brands, so it is not limited to just one brand"
Besides providing various types and brands Mobile, Interphone also offers mobile accessories, mobile phone headset and mobile phone accessories such as Battery original and affordable. "Interphone order can also serve for a certain mobile variant, with the terms and conditions established by the Interphone" said Hery end.